Your success as a rider rests upon the foundation you build for yourself through your physical and mental training efforts. Each building block that you add as you move up the levels of riding is laid upon your foundation, which needs to be stable and secure to continuously support your advancement as far up as you want to go. 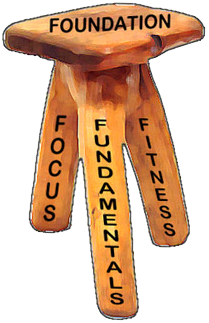 I characterize a rider’s foundation as resting upon three pillars: Focus, Fundamentals, and Fitness. I developed this way of explaining it because the three-legged structure of a tripod is very stable and hard to tip. Even if one leg is shorter than the other two, the structure will still stand up but it will lean over, pointing towards the undeveloped pillar that needs more work. A tilted foundation will actually support you, but only to a certain point. To properly support a successful advancement upwards requires the equal development of all three pillars. Today’s article is the first in a series that will discuss each of these three pillars in detail. Discipline is the bridge between dreams and accomplishment. Focus starts with your mindset, and knowing what you want. Focus is intending to do this, and wanting it enough to give it your attention on a regular basis. I’m talking daily. Daily works best. Really. This doesn’t mean that you have to ride every day. It does mean that you work towards your riding goal every day, and there are many, many ways to do that. Even if you can’t on a given day get in a ride or lesson, work out, eat healthy, visualize your goals, and do some yoga, it doesn’t mean that you can’t do some, or even one, of those things. Don’t fall prey to all-or-nothing thinking that says “I can’t do it all so what’s the point?” That sort of thinking is going to keep you stuck. We talked before about the power of our attention, and the rhyme I use to stay reminded of that power, Energy flows where attention goes. Your unshakeable focus is going to let you harness the power of your attention. To me, focus is the daily decision to keep your attention on what you want (NOT on what you don’t want). So, how do you build your Pillar of Focus? Well-developed focus is so powerful I liken it to a super-power, but the truth is, anyone can develop it. The secret is to start small, so that you can experience the thrill and the energy that comes from actually completing successful steps towards your goal! The second secret is so powerful, and yet so simple that I’m afraid you are going to roll your eyes at me. But here it is, in a word: habits. Make a habit of the things you know you need to be doing to reach your goal. So let’s start at the beginning, and don’t set the bar too high at first. Be willing to be boring and unimpressive. Start with just one thing. Every piaffe-passage transition started a long time ago as a walk-trot. The secret is, it was an extremely well-executed walk-trot. That’s what I want for you. Pick something small to focus on to start, and then actually do it, until it becomes a habit. You want it to become so much a part of you that you don’t even think about it, and if you do think about it, it is to say “This is just what I do”. Now I have no doubt that if you actually did all that, it would help your sitting trot immensely! But the fact of the matter is, more likely than not, your attention is going to be totally splattered by trying to figure it all out at once. You are taking on too many things and are not likely to experience completion or success in ANY of them. My advice: Pick one. Focus on it. Do it. Enjoy the incomparable feeling that comes from completion! And, here’s what’s wild, when you do that, very often many of the other things on your list will effortlessly start to come to pass, too! That is how you develop your big-picture focus, and achieving success with that is going to help you to develop what I call your little-picture focus. This is your focus in the moment, each and every moment when you are riding. Have you ever had the experience of having great rides at home and then when you get to the show ground, everything changes? You find yourself totally distracted by all the goings-on in the crowded warm-up ring, worrying about the dust and the footing, and listening to your fellow competitors gripe about the judging. All of a sudden your horse feels like he was swapped by aliens during the night, and your body isn’t listening to your commands either. This is lack of focus in the moment, and you need to train for it, and build your Pillar of Focus in that area too. Again, it all comes down to the decision to place your attention on what you want, and NOT on what you don’t want. I like to say to myself and my horse “that’s nothing to do with us” when something is trying to distract our attention away from our work. I imagine a large bubble of concentration around the two of us, and everything outside of the bubble is “nothing to do with us”. Just watch that seemingly chaotic warm-up ring and notice the rider who is moving smoothly through their patterns and figures, everyone else magically melting out of their way as they follow their clear lines. That is the power of clear focus. All three of the pillars of our riding foundation are equally important, but I chose to talk about the Pillar of Focus first because developing this one is going to set you up for success in the development of your other pillars. You continue to hit the mark every time. Once again, I will share these pearls of wisdom with those I care about. Thank you. Lori – Even though I long ago abandoned the hope of making riding my life (although someday, I hope it is once again a HOBBY), I can see that your lessons here aren’t just riding. They apply equally well to running or kayaking or life in general. The thing I love about dressage tests is that each movement is scored in itself. So you can decide to blow your score in a movement or two because what you really need to do in that moment is get your horse back in front of your leg, or maybe ride a subtle or not-so-subtle shoulder-in to get his focus away from the scary thing and back on you. And even if the whole test turns out to be not what you hoped for score-wise, if you rode every moment with the thought of making him more focused on you and therefore more through (and not just holding on for dear life and somehow getting through the thing) you can be proud and know that next time, it will go better.